Learn from the experts, but skip the tests! 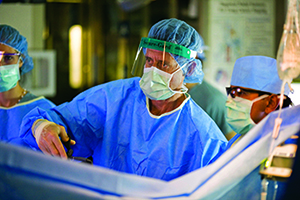 Colorectal surgeon Dr. Michael J. Stamos operates on a patient. Want to learn how to take care of your memory or your skin? Or how to protect yourself again cancer? Whether you really need an X-ray for back pain? Or maybe you'd just like to know how to get what you need from a doctor's office. Get answers directly from the experts at UCI Health’s "Innovations in Medicine: Mini Med School 101." This series of five weekly classes gives you access to physicians and scientists who are defining the future of medicine. Classes start Wednesday, March 15 and continue through April 12, 2017. Each class will begin with a workshop that includes an interactive experience and a reception, followed by a lecture on the evening’s topic. There will be time to ask questions as well. All classes will be held at the Beckman Center. If you attend all five sessions, you will receive a Mini Med School diploma at our graduate reception. You'll also receive a course syllabus with the content of all the lectures. No papers to write! No reading assignments. Best of all, no tests! Registration is full for this session. However, if you would like to be notified about future Mini Med School programs, please email us at taylorkr@uci.edu.